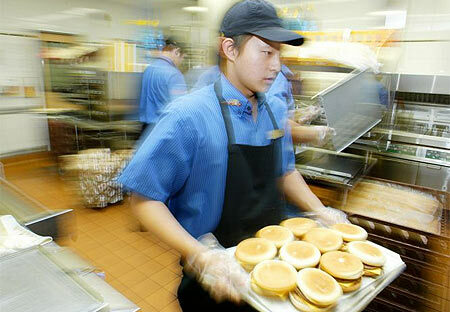 My last job was at a privately owned hamburger restaurant. Although the restaurant didn’t belong to any multinational company like McDonald’s or Burgerking, it was quite big and was open every day in the week, only being closed between 7 and 10 in the morning. Most of the people who worked there were teenagers or people like me in their twenties, mainly girls. The majority had another job or went to school while they were working at the restaurant. People came and went all the time. They didn’t cope with the work conditions or they thought that the wage was too lousy. The majority of the staff were employed illegally and you had to work more than a year to get an ordinary contract and an ordinary wage. Before that, you were an apprentice with a much lower wage. Being an apprentice also meant that the boss could give you the sack whenever he felt like it. Most of the people who worked there chose not to work at the restaurant for more than a couple of months. We were all constantly looking for other jobs or other ways to get money. Many people believed that it was better for the employees at that restaurant than at McDonald’s for example. They thought this because the restaurant was not owned by a big company but by one man and also because there were rumours that the owner gave money to football teams and charities. We who worked there knew better. Leftist people even dared to tell me that it was good that I worked at the restaurant because it wasn’t a multinational company and also because of the rumours about the owners philanthropic personality. They didn’t understand that the conflict between proletariat and capital is in all workplaces, whether it is a restaurant or a factory, a small or a big company, owned privately or state controlled. As long there is wage labour there will be capital, and, as long there is capital there will be resistance to it. This resistance, the class struggle, not only shows itself in dramatic forms of resistance like strikes, occupations and riots, but also in the small escape attempts from work and the hidden struggles directed against value like theft, sabotage and work to rule. This small and hidden resistance against wage labour has been depicted as termites that slowly gnaw through the foundations that capitalism relies on 2. We in Kämpa Tillsammans!3 call these struggles ”faceless resistance” because one of their characteristics is that they are faceless and invisible, something that often also makes them invisible to so-called revolutionaries. If we are so blind that we don’t understand the importance of the daily class struggle, however weak and isolated, then we will never really understand that the dynamic behind these ongoing struggles and activities is in fact communism itself. This everyday resistance is in the worst case even disregarded as something that isn’t interesting at all. For the people who have this perspective it is only the glamorous and heroic struggles like big strikes and occupations of workplaces that count. Either they don’t care about its importance to workers or they just don’t understand it. That the ”faceless resistance” is waged day by day against capital and wage labour, and sometimes can even be more effective than these open struggles, and that they are also the first important steps to a wider and larger community of resistance to capital, is something that they don’t grasp. That communism hides its face behind these struggles is something they wouldn’t even believe in their wildest dreams. For them communism is an economic system that one builds. Not a movement that is born from the womb of the old society, not an activity that fundamentally changes people relationship to the world, to one another, to life itself. As I said earlier, people came and went all the time at the restaurant. Most of the people only worked there for a few months and then quit. Often they had found another job instead or they’d just been fed up with the place. When I worked at the restaurant there was only the boss, his son and the son’s close friends that had worked at the restaurant for more than two years. The conflict between the "new ones " (the majority who worked there) and the few who had worked at the restaurant for a long time, was obvious from the first working day. This showed itself very clearly because it was the boss’s son and his friend that did the work schedule and therefore always got the best work shifts. Not only we who had just begun to work there but also people who had worked there several months or up to a year got the bad work shifts, mainly nights, especially Friday and Saturday nights. They also told the boss everything we did and said, therefore they soon became regarded as the boss’s spies. It was also these people who told us the rules at the restaurant – for example, that you weren’t allowed to talk about the wages and compare them with each other. This of course meant that the first question we asked a new work mate when we met him or her was how much he or she earned. The "new ones" (the majority who worked there and who hadn’t worked more than a year) didn’t identify with their work or their workplace. We were there because we needed money and we were open with each other about this. The new ones were also rather open to each other about the fact that we all in our various ways tried to escape from work. Two work mates and I created something that can be compared with an affinity group. This was not something we’d planned, although of course we had talked about not liking the job, that we thought the pay was to bad and stuff like that. But we had never talked about trying to create some activities against work. This happened almost spontaneously. The first thing we did together was that one of us punched in the other at the time clock. I can’t remember who did it the first time, but this small escape attempt from work was something we continued with but now planned together. This meant that two of us could come into work very late and we were paid for the time we weren’t there. It also worked very well for the person who worked alone because at the beginning of the work shifts there was often nothing to do. We had to be quite careful so that the boss or his little "spies" didn’t catch us. After this we began to take money from the cash register so we could play pinball or listen to music from the jukebox, or sometimes take the money home. One of the boss’ rules were of course that we weren’t allowed to listen to music or play pinball at work (even if we paid with our own money), which of course we didn’t care about. If we didn’t take too much money from the till the boss didn’t notice anything because he had a small margin to allow for people punching in the wrong price at the tills. Another thing we did to get money was to type in the wrong price at the tills so the boss couldn’t even notice that money was gone. When we played pinball or just were lazy we had to see that the customers were not neglected too much, because many of the people who used to go to the restaurant were friendly with the boss. All these small attempts to make the workday more fun and less alienating was something that we tried to spread and circulate to other work mates which we didn’t usually work with. We didn’t do this by talking openly about how to flee work. Instead we tried to let the activities speak for themselves, and then after that we could be more open about them. Many people of course did these things already. We shared tips and everyone had their own way to make the workday less boring and more fun. For example, I shared our small "affinity groups" experiences about how to delay the working day with other people that I worked with, so the boss thought that there had to be three people on the shifts. Most people thought that it was better to finish a bit later than to have to work harder all day. One of the big weaknesses (apart from the fact that they all were very defensive) with our escape attempts from work was that we didn’t even try to involve more people, especially the ones who had worked at the place longer than us. We simply assumed that they were all loyal to the boss and the workplace. Work is our activity separated from us, turned into something that fuels the economy and dominates us. And this process can be changed because we are the ones that feed it. We are the contradiction. No work is only imposed from outside. It supposes some cooperation from the rank and file, as the Renault worker Daniel Mothé showed in his Socialisme ou Barbarie articles in the 1950s. What we’ve described as petty theft, small scale sabotage and fun (all of which imply self-organization) is also what makes the restaurant tolerable. Resistance to work is a way of retrieving some "humanity" that work deprives us of: it therefore makes our workday less alienating. Denying this is to misunderstand how capitalism functions, and why it carries on in spite of its numerous horrors. The self-organization of the work life (and of its struggles) is paradoxically also a condition for a possible revolution. We are what we eat... True, but we also are what we do. We eat as we live. It would be naive to assume that there could or will exist one best way of eating, the one and only health food. Here again, the reader will understand we’re not advocating universal organic vegan meals. 1. When I state that communism is a movement, I mean that it exists as a dynamic behind the class struggle or as a tendency in it. We don’t see communist society in the class struggle, we see communist "potentials". Every struggle against capital has a universal aspect because it is a protest against an inhuman life, and that is a seed for a future human community. "A social revolution has thus a universal aspect, because, though it may occur in only one manufacturing district, it is a human protest against an inhuman life, because it begins from the single real individual, and because the social is the real social life of man, a really human life." But it’s important to understand that it is just one aspect, and also that the seed cannot grow in just any situation. 2. This quote comes from the group Kammunist Kranti in India. It can be said that capital has survived those attacks because these termites also work for capital. This is true, but it is also true that capital needs and tries to control and destroy all these secret struggles. And it is also in the conflicts at work, in the proletarian struggle against wage labour, where we can find the liberating activity to free ourselves and destroy capital. 3. Kämpa Tillsammans! means "Struggle together!" and shall be understood as an imperative. 4. I don’t mean that the proletariat and the bosses have the same interests. Every struggle will eventually in one way or another confront the bosses, police, managers or other functionaries of capital. The thing I want to underline is that it is not the bosses who are in control and that at the restaurant our relation with our boss, in a paradoxical way strengthened the "communist perspective" in the struggle. It was clear to all, that it was not the boss which was the enemy, but rather the thing we were opposed were the absurdity to work for money. I love this. It is "Capital" explained in concrete terms, or rather "Capital" describes this in formal academic terms. Anyone who is thinking of ploughing through "Capital" should read this text, it is practical theory in the clearest possible sense. 'We are the contradiction' is by Marcel and Gillés Dauve. It says so in the introduction.